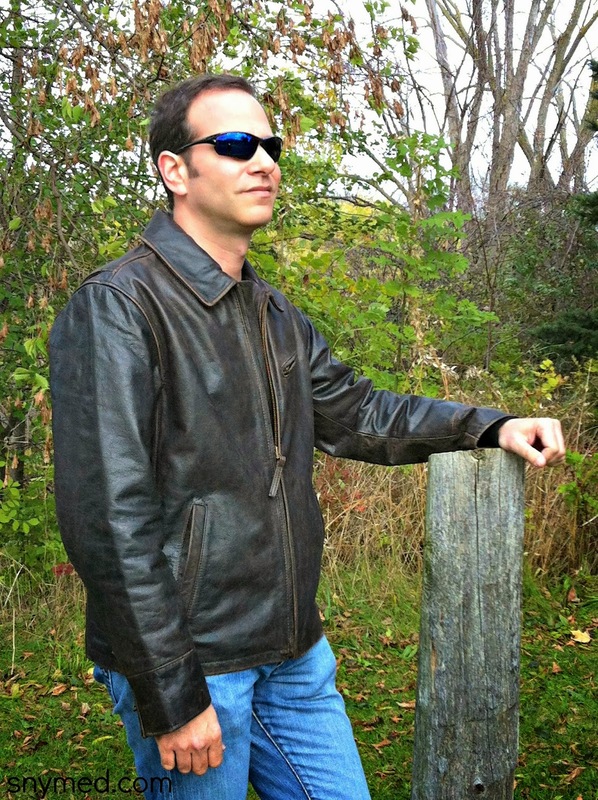 Guys, What to Wear: Eddie Bauer Journeyman Bomber Jacket! 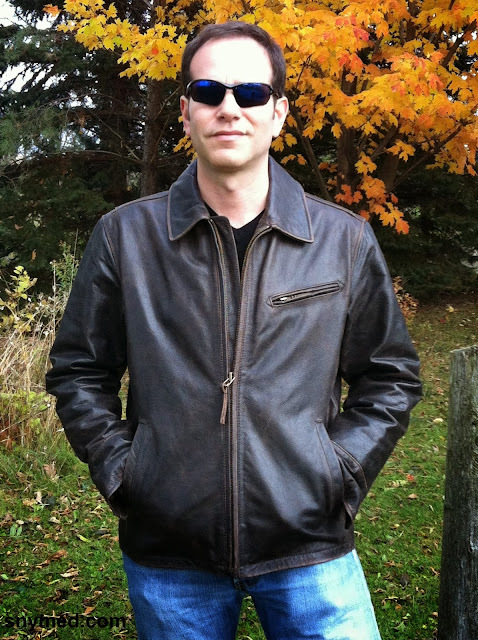 Please give a warm welcome to today's writer--my brother--Adam Ess! This fall, the time had finally come to replace my favourite go-to jacket. It had served me well over the years, but was looking dated and somehow like it had been run over, fallen into a lake and met the business end of a rusty rake. I knew the replacement would have to be comfortable, would have to be rugged and, importantly, would have to look good. I also knew it wouldn’t be easy to find. I’m a terrible shopper, and hate the thought of spending any time at a mall. Weaving through endless crowds, sifting through packed displays and getting pestered by overly persistent salespeople are annoyances I’d just as soon avoid. Luckily, online shopping makes this easy to do. After surfing through the sites of various brand-name e-tailers, and finding little of interest, I decided to check out an old favourite: EddieBauer.com. I’ve been a customer for the past 25 years—outfitting myself with their backpacks as a student, stocking up on causal basics as a grad, and equipping for winter with their down parkas as a family man. EB was great for practical gear and they stood behind their stuff. After spending some time browsing through their many outerwear options, one piece really caught my eye—the Leather Journeyman Bomber. Vintage brown, made of genuine buffalo hide and full of attitude, this was exactly what I wanted. I’d noticed EB getting back to its roots over the past few years with clothes that had a retro-classic look, and this jacket was a great addition to the lineup. Into the virtual shopping cart it went! The next week, a big Eddie Bauer box arrived at my door. I wasted no time with opening it, and took out the well-packed jacket. Not having had the chance to try it on before ordering, though, I wasn’t sure what to expect in terms of fit. I pulled off the packing, put on the bomber and checked out the mirror. Then I grinned. The jacket looked great and fit perfectly, and the medium I chose was true to size, with room to spare for a sweater or fleece. The buffalo leather had that elusive, lived-in character that just gets better the more you wear it, and the bomber looked as if I’d owned it for ages. Features of note include zippered cuffs, adjustable buckled tabs at the waist, two hand-warmer pockets, a zip pocket on the chest and a generously sized inside zip pocket to hold a phone, keys, change, multitool, iGadget, guitar tuner, brass knuckles, power bar or whatever else might need to be stashed. The Journeyman Bomber is one of those essential pieces of kit that’s always classic—a hero jacket. It’s the kind you’ll see on your favourite big-screen action star as he burns rubber on a commandeered bike after rescuing the girl, escapes with a satchel of spoils from the collapsing ruins of an ancient temple, or holds his own in a brawl against a bunch of baddies, all while shooting off well-timed wisecracks and sporting a self-assured smirk. After spending a week so far wearing this jacket, it wouldn’t surprise me if it lasted a long time—long enough for my son to grow up and want to borrow it. Not that I’d want to part with it (sorry, little man, we’ll get you your own). The only additions that would have been nice—and these in no way make me like the jacket any less—are insulation for the lining and flannel or fleece for the hand-warmer pockets. This is Canada, after all, and our Fall does get a bit frosty. But these are minor gripes about what’s really a great jacket. 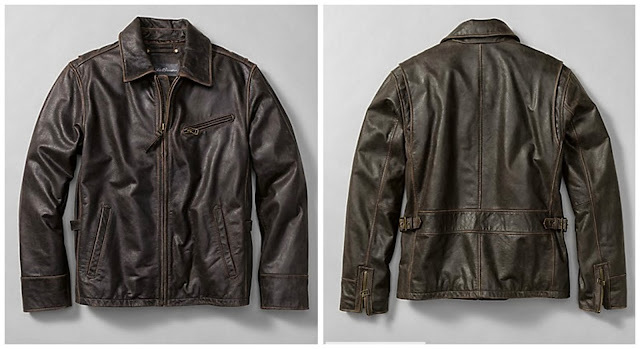 Whether you’re thinking of grabbing one for yourself, or picking one up as a gift for someone who’d appreciate an iconic favorite, you can’t go wrong with the Eddie Bauer Leather Journeyman Bomber! What is your go-to item for fall? Have you ever shopped EddieBauer.com or Eddie Bauer? Have you started Christmas shopping for your husband, boyfriend or son? I really like this jacket! This is exactly what I want for my husband his is wearing out. (It's from a competitor company. *coff). I am going to check this out. Love, love, love that jacket! Stunning jacket! My husband would look great in that! 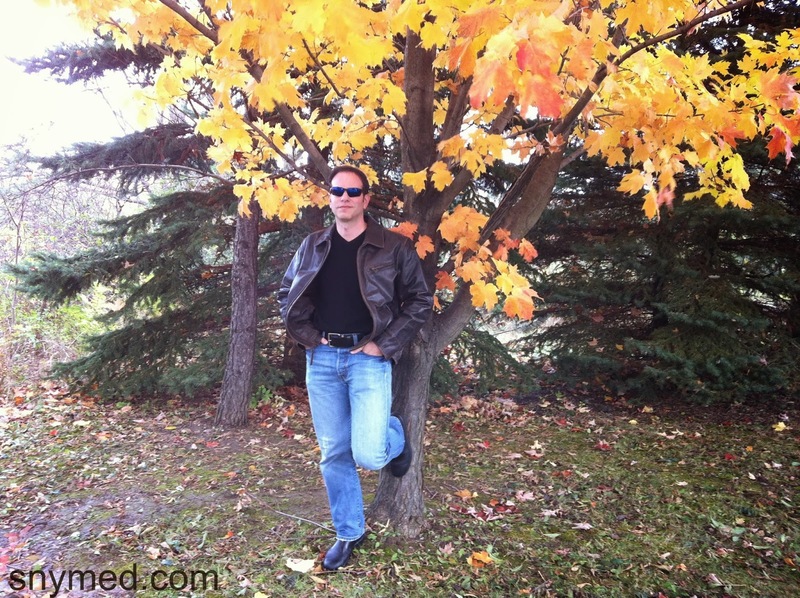 I usually pick up something from Eddie Bauer for Christmas - time to start making my list. This is a really nice jacket! I'm pretty sure my husband would love it too. Looks perfect for cold weather Harley riding! Great jacket! I have to say that I never purchased from Eddie Bauer, but will definitely stop by the store for Christmas shopping this year. Thanks for sharing. That is a really nice jacket!